The careful study of a bulky register of a guesthouse in Godhra has added an entirely new dimension to the investigation into the Godhra carnage. The new findings led to the arrest of Ali Mohammad and Ghulam Nabi Dingoo of Anantnag district in Jammu and Kashmir in the last week of October. The Godhra investigation saga is amazing, and still incomplete. 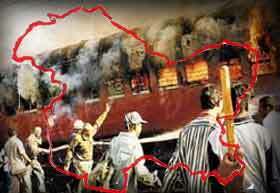 Initially, the police investigation led to the charge that on February 27, 2002, a crowd of almost 2,000 people, mostly residents of a Muslim-dominated locality in Godhra called Signal Falia, stopped the Ahmedabad-bound Sabarmati Express just as it began to move out of Godhra station, and burnt a coach, killing 59 passengers. Apparently, the mob was incited after some vendors at Godhra station claimed to have been roughed up by a couple of passengers. More than 70 people were arrested. But the initial investigation left much to be desired, and with little evidence to back up the police charge, many of the accused were out on bail. Moreover, the police were unable to draw the sequence of events to decipher what exactly happened. Then, last April, a new team headed by Rakesh Asthana, deputy inspector general of the crime branch, criminal investigation department, joined the investigation. Asthana is a low-profile police officer with a reputation for having cracked some big cases such as the fodder scandal that implicated former Bihar chief minister Laloo Prasad Yadav and the Purulia arms drop case in West Bengal. In July, the Gujarat police asked for a forensic test of the burnt parts of the S6 coach to help reconstruct the chain of events and got a huge surprise. The forensic study found that the torched compartment had not been burnt from outside, as was widely believed, but from inside. Around the same time, the police got an eyewitness. The youth Ajay is believed to have been the lone Hindu in the mob, and he claimed to have ferried inflammable material to the S6 coach from Aman Guesthouse located opposite the railway station. The guesthouse, established in 1999, is owned by a man named Razzak Kurkur and was searched by the police. Kurkur, a man of some notoriety who was allegedly involved in several illegal activities in and around Godhra, was arrested in October. Kurkur is believed to have masterminded the coach-burning act. In July, when he was still in hiding, the investigators searched his guesthouse and found a huge box in a room. The box contained the uniform of a Central Reserve Police Force policeman. Simultaneously, the investigators ordered a micro-examination of the Aman Guesthouse register, which had been seized in the first search five months earlier but remained unstudied. On examining the entries from 1999 onwards, the investigators found that 20 names appeared frequently. The police probed all of them. Three names caught their attention: Nanhu Miyan, Ali Mohammad, and Ghulam Nabi Dingoo. Further, on examining telephone records, the cops found that many calls had been made from the guesthouse to Anantnag in Kashmir. Nanhu Miyan's register entry said he was a resident of Rampur in Uttar Pradesh, where the police found his Hindu wife and two children. The police also discovered that Nanhu Miyan had been dismissed from the CRPF in 2000 for absenteeism. Also, in 1995, he had been posted in Kashmir. After keeping a watch over his Rampur residence for more than a month, the police nabbed Nanhu Miyan when he tried to visit his family. And the case became even more curious. Nanhu Miyan is an Assamese who settled down in Rampur with his father-in-law. He is believed to have admitted that when deputed to Kashmir, he came in contact with an Anantnag-based gang of Kashmiris that trafficked narcotics, mainly hashish. According to the Gujarat police, Nanhu Miyan was a courier for the Kashmiri gang and used his CRPF uniform to avoid raising suspicion when travelling. He told the police he worked for the gang mainly to make money. Miyan is in his late 40s and, say the police, did not behave like a classic fundamentalist. His arrest led the Gujarat police to Anantnag where Ali Mohammad and Ghulam Nabi Dingoo were nabbed. All three have been lodged in Baroda central jail. The police claim to have evidence that Nanhu Miyan, Ali Mohammad and Dingoo were in Godhra in February. Apparently, Mohammad stayed at Kurkur's residence while the other two were in separate dwellings. None of them was in Godhra on February 27. But even though the police evidence shows that the three made numerous calls to Kashmir in February 2002, they still do not have anything to link the terrorism in Kashmiri to the burning of the coach. Under interrogation, Nanhu Miyan allegedly confessed that the Kashmiri gangs, which have links to various terrorist outfits, wanted Godhra to be a transit point for their drug trafficking. But why Godhra, when Ahmedabad and a few places in Rajasthan are known to be centres for the illicit trade? Also, why did Nanhu Miyan introduce Godhra and Kurkur to the Kashmiris? Another missing link is the absconding Kashmiri man who was the link between Miyan and Ali and the Kashmiri militants. The Gujarat police now believe that the drug trafficking channel was also used to bring arms into Gujarat. Along with Miyan's CRPF uniform, an arms usage manual and training material on handling weapons, using grenades and automatic rifles, and laying mines were found in the Aman Guesthouse. The Gujarat police is convinced that not only was prime accused Razzak Kurkur into drug trafficking, but that he was a hardened criminal 'who would not think twice before committing any serious crime'. When contacted by rediff.com, Asthana refused to comment on the police investigations. "Wait for some more time," he said.